This century-old town is still poised as home to people who love simple, serene, peaceful and laid-back life despite major developments over the past decades. Founded in 1820, Liloan begun its ecclesiastical work in 1918. Its territory, which is in the northern part of Panaon Island, is composed of 24 baranggays (villages). The town’s sea waters are also considered as a landmark in World War II because it was here when the Japanese and the liberation forces first fought on October 20 to 25, 1944. The place has a “wawa” (strait passage), which connects the mainland of Leyte and Panaon island on the south. It looks like a blind diverticulum except that on closer distance where you can see a tiny passage. The town is accessible from Manila, which is more than an hour travel via plane, bound first to Tacloban and take three hours drive to this town through a 159 kilometer stretch of road from the regional capital. From Cebu or Bohol, it would take six hours of travel via ship going to Hilongos Leyte, then from Hilongos, ride a bus bound to Sogod, then to Liloan. Another beautiful white sand beach is found in Molopolo Beach Resort in Molopolo village. It is a 20 minute-drive away from the town center. The site is one of the attractive beaches because of the fine white sand. The lovely mountain ridge in Fatima village could also be the best place for people who want to relax and breathe fresh air for it is surrounded by tall trees. Along the way are coconut trees that give shades and fresh coconut juices, with a very sweet and refreshing taste. The amazing scenic creatures under the sea such as colorful fishes, corals, seaweeds and whales can be found in Gud-an. It is a 20 minute-drive away from town proper. Scuba-divers usually enjoy the view under the sea in the place. The lighthouse at Caducan District, in the town proper is the best place for people who love picnic with family and friends. The lighthouse stands like a warden of the bay, which is a safe harbour during turbulent weather. The fresh forest waters in Magaupas Colour Falls also attract many people. Some say the startling place give the coolest feeling ever. Tagbak Marine Park, which is located at the center of the sea, is the site best for swimming, fishing and snorkelling. The snorkelling site can be reach through a 5-minute tricycle ride from the town proper. Town tourism officer Eugenio Tahil said that more than 500 people including local tourists have visited the different tourist attractions in town every week. 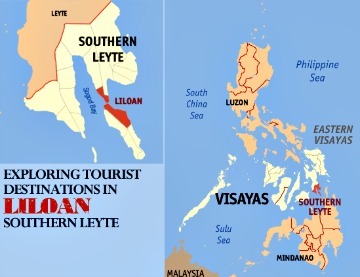 “Right now, we are doing our best here in the tourism department to make Liloan’s hidden tourist attractions more famous not just to Southern Leyte, but throughout the Philippines," Tahil said. For visitors’ stay, there are Rikamae lodge located near the Liloan Ferry Terminal and Ofelia Lodging House which is found near the town market. Tourists could also stay in Hidden Valley Resort in Anilao, which is a 20 minute-drive from the town center. One of the best local kakanins (tidbits) to eat in the place is buwad (fried dried fish), which is best serve with vinegar and rice. Lydia Malubay, 40, a native of Liloan said that the local delicacies she loves to eat is the calamay (sticky sweet delicacy) and suman (rice cake). “For beach outing, sinugbang isda (grilled fish) and sinugbang karne (roasted meat) are foods that are best to eat,” Malubay suggested. There are also motorcycle and bicycle dealers, banks, pawnshops, clinics and hospitals, pharmacies, convenient stores, hardware supplies, internet shops ,department and appliance stores, fish markets ,lodges, restaurants, bakeshops, salons and barber shops, gas and water stations in town for peoples’ convenience.